These Hot Cross Buns are a traditional recipe for celebrating Easter weekend. These soft, spiced, sweet yeast rolls are made with instant yeast and flavored with cinnamon, allspice, nutmeg, and (optional) orange zest. 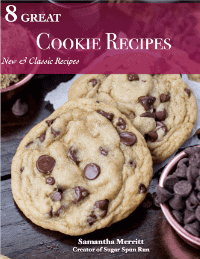 Recipe includes a how-to video where I’ll show you step-by-step how to make these in your own kitchen! Before we get into today’s Hot Cross Buns recipe I want to thank everyone for sticking with me through the ice recipe that I shared on Monday. I hope you enjoyed reading the post and watching the video as much as I enjoyed making it! Today’s recipe is slightly more complex than Monday’s. 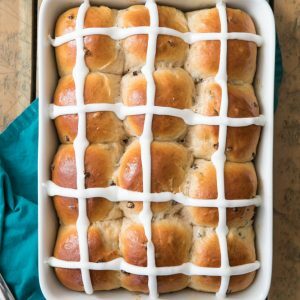 I’m sure you’re familiar with Hot Cross Buns thanks to the popular children’s nursery rhyme or their popularity in grocery stores and bakeries around Easter. Hot Cross Buns are traditionally made and sold during Lent (though I’m yet to see them as cheap as “one a penny, two a penny”). Aside from being delicious, they also are an important part of Good Friday and Easter traditions, and you can read more about their origins, traditions, and superstitions here. 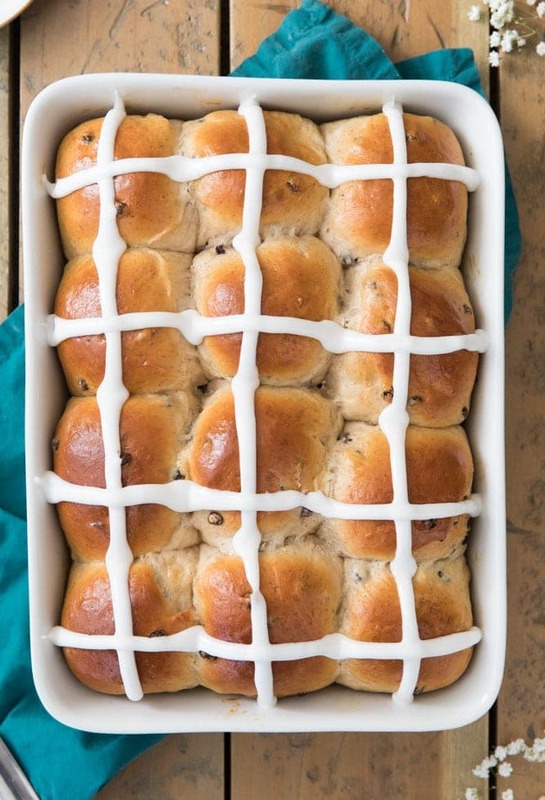 Hot Cross Buns are soft, fluffy, sweetened yeast rolls. They are flavored with spices (and optional orange zest) and in this case topped with simple icing crosses. I know I’ve mentioned in my Oatmeal Cookie and Carrot Cake recipe that I kind of really hate raisins. You can leave them out if you also have good taste 😉without causing any problems or issues with the recipe. Even though I don’t love them, they are a traditional ingredient in hot cross buns so I felt I had to include them. And in case you’re wondering, yes I definitely did pick around the currants like a 5 year old when I ate mine. Yes, there’s yeast involved, but this Hot Cross Bun recipe really isn’t that difficult to make. I’ll walk you through all the steps below, and don’t forget to check out my video if you’re nervous. Combine dry ingredients (most of them). 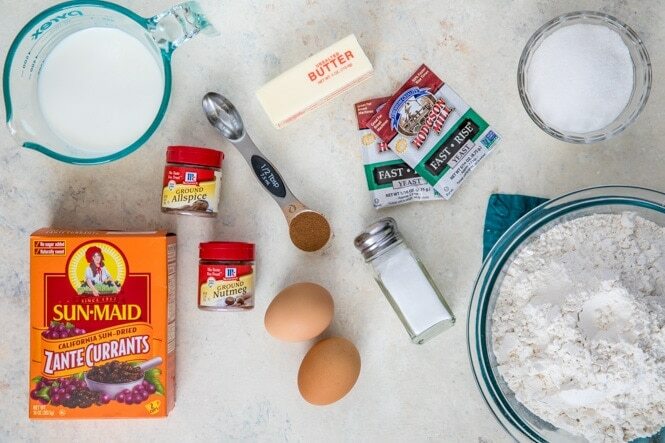 Sugar, instant yeast, salt, cinnamon, allspice, nutmeg, and just two cups of flour should be stirred together in the bowl of your stand mixer. Melt together milk and butter. Either on the stovetop or in the microwave, heat milk and butter to 120-125F. If the mixture gets too hot, make sure you let it cool back down to 125F or cooler. If the liquid is too hot, it will kill your yeast and your hot cross buns won’t rise. Stir milk/butter into dry ingredients. Stir in currants or raisins and orange zest, if using. Add more flour as needed. You’ll need around 3 1/3 additional cups of flour before your hot cross bun dough reaches the proper consistency. Rather than going based off of how much flour you’ve added, you should judge your dough based off the texture (same as with my pizza dough). It should be smooth and clinging to itself and pulling away from the sides of the bowl. It will be tacky to the touch but not so sticky that it sticks to your fingers. Watch my video (below the recipe) for a clear visual. Place dough in an oiled bowl, cover, and allow to rise until doubled in size. Divide rise again, and bake! 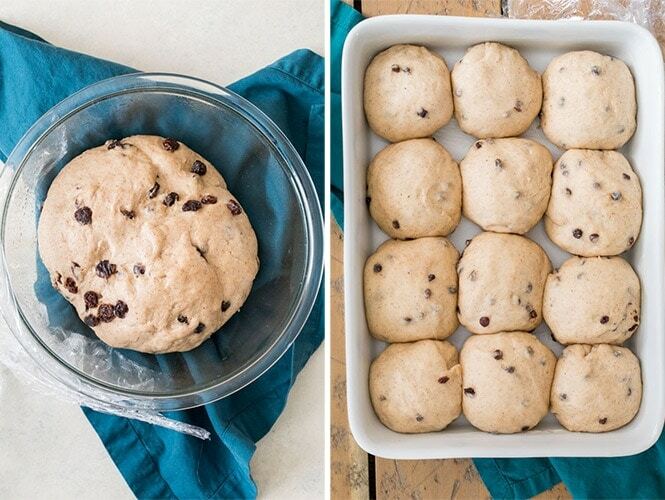 Divide the hot cross bun dough into 12 pieces and place in a lightly buttered 13×9 baking dish. After dividing, allow to rise another half hour then brush with egg wash and bake until golden brown. Allow to cool, then pipe icing crosses over buns. Enjoy! 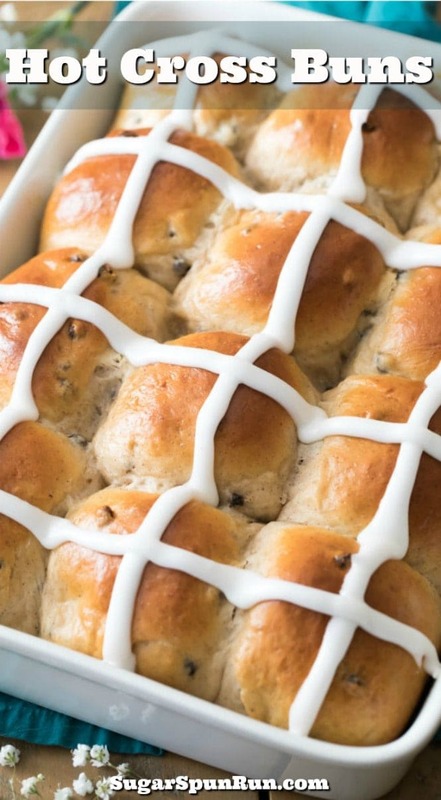 Some hot cross bun recipes use a simple pastry dough to make crosses that are placed on the buns before baking. These bake into the dough and look really cute, and the buns are often brushed with apricot jam for additional sweetness before serving. However, I tried these hot cross buns both ways and my family hands-down preferred the ones with the icing crosses. The icing really complements the buns and reminded my taste testers of cinnamon raisin bread in the best way. 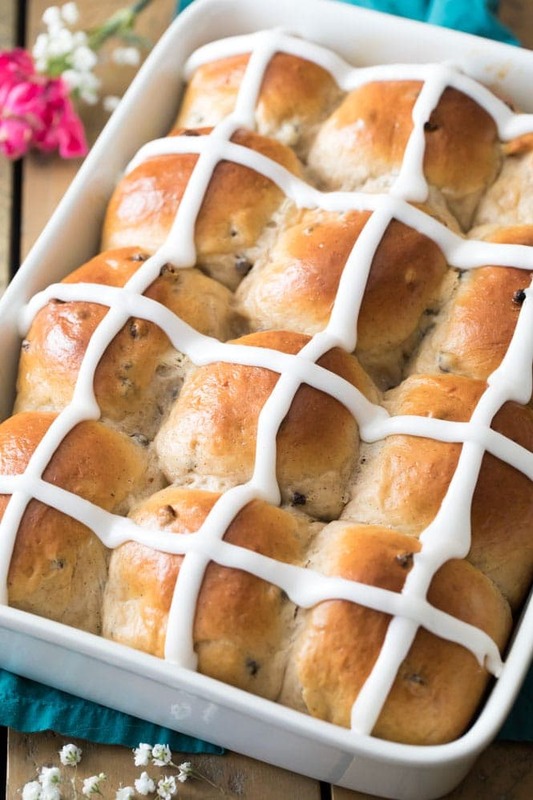 These Hot Cross Buns are perfect for celebrating Easter. I'll walk you through how to make these sweet yeast buns from scratch. This recipe can be cut in half if desired. In the bowl of a stand mixer, combine 2 cups (250g) flour, sugar, yeast, salt, and spices. In a small saucepan, heat milk and butter until butter is melted and mixture reaches 120-125F (48-52C) (if the mixture becomes too hot, let it cool back down to the correct temperature range, otherwise you run the risk of killing your yeast). Turn mixer to low speed and gradually pour liquid ingredients into dry. Once just combined, add eggs and stir until combined. With mixer on low speed, gradually add remaining flour (415g) as needed (it's possible you will not need to use all of the flour) until dough attains a smooth elastic texture that’s tacky to the touch but not too sticky. The dough should be clinging to itself and pulling away from the sides of the bowl. Add additional flour if needed. Form the dough into a ball and place into a lightly oiled bowl. Roll dough through oil and cover bowl tightly with plastic wrap. Place in a warm, draft-free spot and allow to rise until doubled in size (usually 30-60 minutes). I usually preheat my oven at this point and place my dough on the top of my preheating oven, as that’s the warmest spot in my house. Preheat oven to 350F (175C) and lightly butter a 9x13 pan. Set aside. Once dough has risen, punch down and transfer to a lightly floured surface. Form into a log that’s 12” long and cut into 12 even slices. Form each slice into a round ball/roll and place rolls almost touching in prepared plan. Cover tightly with plastic wrap and allow to rise again for 20-30 minutes. Once rolls have finished their rise, combine large egg and 2 teaspoons of water in a small dish. Use a whisk or fork to beat until well-combined. Remove plastic wrap from rolls and use a pastry brush to brush the top of each roll with egg wash mixture. Transfer to 350F (175C) oven and bake for 30-32 minutes or until rolls are golden brown and are firm and sound hollow when tapped on top. Allow to cool before covering with icing. Prepare icing by whisking together powdered sugar, milk, and lemon juice. It should have a thick consistency that holds its shape for piping, if it’s too thin then add more sugar, if too thick then add more milk. Spoon icing into a small piping bag or into a ziploc bag and snip one corner. Pipe crosses over buns. ¹I have successfully made this recipe by substituting an equal amount of active dry yeast, just keep in mind that it will need to rise for longer. Can these be made ahead? We are going out of town on Friday and would like them to be fresh for Sunday. When I was younger I made Hot Cross buns and used mixed candied fruit in place of the raisins. Can these be refrigerated after forming the rolls and baked the next day? Thanks for this recipe. A suggestion for replacing raisins/currants in this recipe is to substitute chopped or diced Dates. The appearance is the same but the taste and texture is somewhat different. Enjoy and Happy Easter. Thank you for this tip, Charlene! I appreciate it! Happy Easter to you, too.